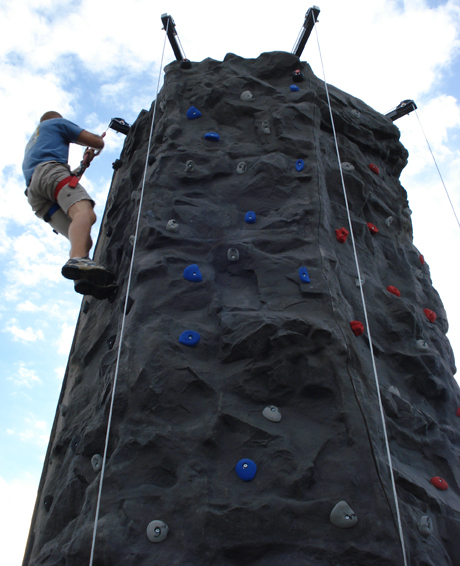 The Drop-A-Rock 5-climber was created for those who demand the highest capacity for the largest events. It also makes sense for those who frequently work pay-per-play events such as festivals. You can expect up to 100 climbs per hour with this model! The Drop-A-Rock 5-climber is nearly the same build as the 4-climber model, but with the obvious addition to capacity. It uses the same attractive climbing surface, reliable dual-axle bumper-pull trailer, and auto-belay safety system. The Drop-A-Rock 5-Climber is available in 3 heights: 24′ (7.3m), 28′ (8.5m), or 32′ (9.75m). Our exclusive Auto-Belay system and 12v hydraulic setup ensure that the rock wall is easy to operate. It’s the perfect portable rock climbing wall for carnivals or fairs, boy scout jamborees, large school events, special promotions, fundraising, team building events, nightclubs, etc.